Someone gave us some beautiful garden spinach the other night, but since we haven't eaten much salad in the past year (it hasn't done well with my stomach issues) we didn't have any dressings on hand. 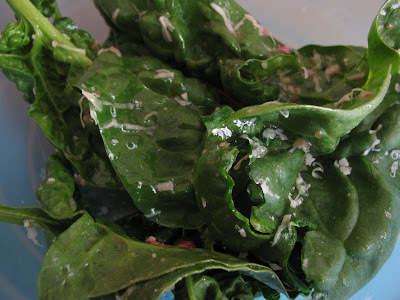 Though Mahon and I are both diehard Ranch dressing fans, we wanted something quick and easy the other night to eat our spinach with. We both also happen to be diehard fruit vinaigrette fans, so I took a few nearly-dead strawberries in our fridge and whipped up this strawberry vinaigrette! It turned out PERFECT, and was so easy to make! Mash strawberries with fork until they are well mashed and separated, but not pureed. Add vinegar, olive oil, salt and pepper and mix vigorously with a fork until liquids are combined. Add honey a little at a time until the dressing reaches the desired flavor—it shouldn't be sweet, but it shouldn't be take-the-roof-of-your-mouth-off sour, either. Add more salt and pepper if desired. Serve over any kind of salad—it was to die for on our fresh spinach!